I have off the water for about two weeks now spending time with my grandson during spring break. It was good to get back out especially with regular clients [and friends]. We started out pulling boards and worked flats ranging from 5 to 25 feet deep. We took quite a few hits [at least 40] and caught a lot of fish but only managed 4 keepers. By noon I had covered every pattern I could hit using planner boards so I made a decision to do something completely different. On the way to pick the guys up this morning at their dock I had noticed a lot of Stripers 20 to 30 feet deep. I decided to spend the rest of the day working downlines. We looked for fish on the Simrad with little success so I decided to simply pick a piece of structure and work it thoroughly. The move actually paid off with another 40 to 50 hits. Although we still got punked we did manage to catch eight more keepers. I believe the unstable weather conditions were the reason for all the short hits and lack of big fish today. All the strikes did make for a fun day for my crew and kept them on their toes reeling in Stripers. 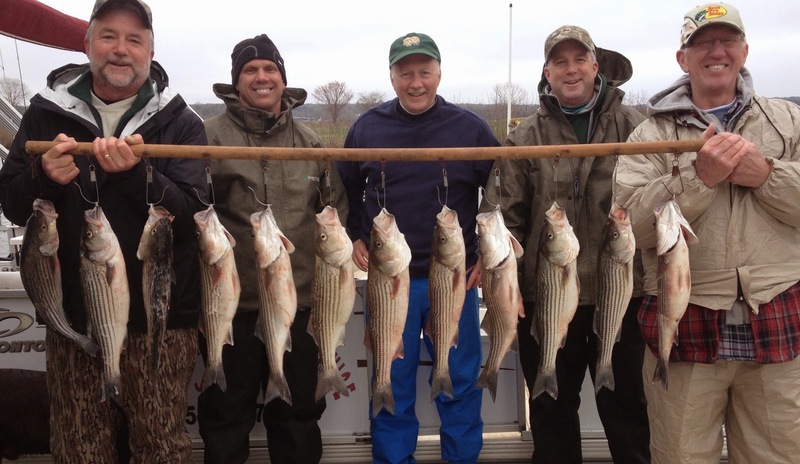 Looks like the weather may straighten out next week and hopefully we can start working on Spawning Stripers.